Yourself in sprite form - GLAM! I was wondering if you guys would be interested in a collab of ourselves in sprites form? This colab should be 100% pixeled, no toolying, and should be baseless. what do you guys think? would you be interested in joining this project? Last edited by sabrina on Wed Apr 24, 2013 11:04 am, edited 1 time in total. 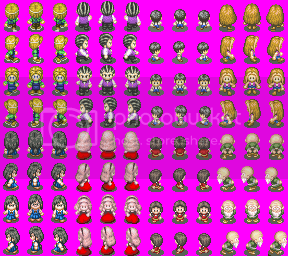 There are sprite bases out there, just in case the 'baseless' part would scare off anybody. Can't we go a little bigger, like Pokemon trainer sprites...? OKami_hu wrote: There are sprite bases out there, just in case the 'baseless' part would scare off anybody. whatever i say are just guidelines, a collaboration, after all, involves a lot of people so we should choose this things togather. Using a base will do, and bigger too. I would definitely be interested in working on this collab, even though the thought of pixeling scares me! I agree that we should probably do something a little bit bigger, such as the Pokemon Trainer Sprite Base that OKami_hu suggested. That way we could put more details into the dolls without them looking like awkward little blobs. i like how the challenge is having really few space and trying to make something awesome. Oh! I really like the ones by leviathen; they seem to have more variety, I guess. Neat idea! And the one by ichitoko has my vote. The other one is too inconsistent for my taste. And the ichitoko one is more video game sprite-like to me. At least the games I've played. I just don't like those inconsistent bases. I guess that's kind of how games are, though. Just out of curiosity, how are those bases inconsistent...? The heads for the most part. They aren't all the same size. Is this still a thing? I hope so! I'd love to all agree on a base so we can get started! Definitely! This seems like a really fun collab. Totes. I'd love an update on what's going on! I don't even care what base, I just want to participate, lol!